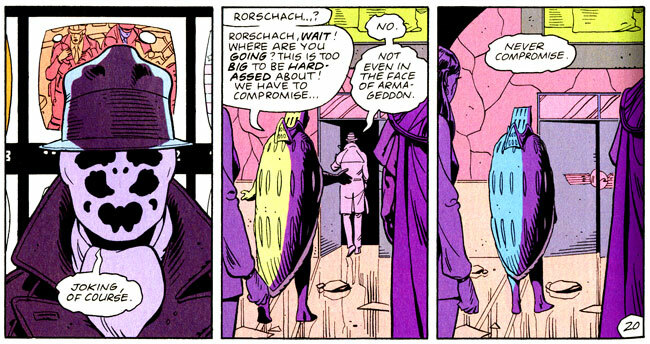 The story behind the quote: The quote comes the Alan Moore comic Watchmen, which was later adapted to a feature length film of the same name. Both the comic and the movie takes place in a world on the brink of nuclear war and a group of costumed heroes try to solve the murder The Comedian, a former comrade of theirs. There’s a lot more going on but, if I did try to cram all of the details of the incredibly dense narrative, this would be one long paragraph. Geek wisdom: A person’s integrity and humanity will never be tested when things are easy. They will only be tried during times of hardship and when we feel we need to compromise. While some people may believe that conceding may be the proper thing to do, there will be people who will be sticking to their guns no matter what. These are the people that may not be able to see the greater good of compromise or these people may be the ones who are the true heroes for standing up for their beliefs even if they are not popular. Ultimately, only history will say which was the right choice.